The Boulder City Honor Guard is part of the Southern Nevada regional multiagency honor guard, which means all Southern Nevada law enforcement agencies act as one unit when together. Some of the duties that could be requested of this group include rifle team (21 gun salute), colors (U.S. and Nevada flag with two rifles on either side), flag detail (all agency department flags), formations or to line procession routes. They participate in wreath detail, casket detail, parades or formal events. Honor guards honor fallen officers to show respect for them and their families. Boulder City currently has two honor guard members, Sgt. Aaron Johnson (flags) and Sgt. John Glenn (rifles). There are three additional positions being recruited to form a local colors detail. These officers participate every year in local and state law enforcement memorial ceremonies in Las Vegas and Carson City, the 9/11 ceremony in Las Vegas and all fallen officer funerals in Southern Nevada. They have previously been honored to participate in a national law enforcement memorial ceremony in Washington D.C., as well. Nov. 9. Animal: The homeowner and the pest control person will be waiting inside for the officer to remove an “enormous” snake from the garage at 12:42 p.m. in the 200 block of Granite Court. Suspicious: The neighbors are suspicious of subjects in the area driving slowly and leaving notes on vehicles and houses that are not posted for sale at 2:45 p.m. in the 1100 block of Comanche Way. Thought for the day: Officers finally locate the suspicious people leaving notes and believe they may be travelers looking to inhabit or remove property to sell. Beware. Nov. 10. Theft: Computers have been taken and not returned after their use at 7:29 a.m. in the 1200 block of Avenue G.
Grand larceny: Thefts have been on the rise, but the theft of a port-a-potty just might be a first at 10:21 a.m. in the 1400 block of Drone Port Road. Thought for the day: Refraining from a zillion potty comments worth flushing. Nov. 11. DUI: The driver makes a poor choice for breakfast at 8:02 a.m. in the area of Avenue B and Wyoming Street. Parking: The owners of several vehicles posted and parked for sale at a local shopping mall are getting the boot at 1:48 p.m. in the 1000 block of Boulder City Parkway. Thought for the day: The asking price may have to be increased to pay all the tickets; tag and tow is in order for the future. Nov. 12. Petit theft: Some less-than-petite perpetrators with very large purses are on camera and about to become famous at 9:14 a.m. in the 1000 block of Nevada Way. Fire: The fire is thought to be electrical with an added dose of owl on the menu at 5:11 p.m. in the area of Georgia Street and Buchanan Boulevard. Thought for the day: OK, no owl jokes either. Nov. 13. Threats: The caller states there may be someone under the porch making threats at 5:41 a.m. in the 700 block of Capri Drive. Assist other: The female in black clothing and a red car is throwing rocks at a nearby driver at 5:16 p.m. near mile marker 39 on U.S. Highway 95. Thought for the day: The stoner female decides to abandon her vehicle and trudge off into the desert, and the stonee in the other vehicle decides there’s no damage. Nov. 14. Disturbance: The ole bonfire and beer night comes to an abrupt end at 2:14 a.m. in the 500 block of Arizona Street. See a person: The owner of the weapon states it was stolen in Arizona by a relative, and now she wants it back from the pawn shop at 2:17 p.m. in the 1000 block of Arizona Street. Thought for the day: Nothing like a middle-of-the-night sprint with no shoes to get your buzz gone. Nov. 15. Drugs: The caller believes there are narcotic sales going on, and the outstanding warrant provides accommodations for the night at 9:02 a.m. in the 1000 block of Nevada Way. Temporary protection order violation: The subject has not gotten the hang of the terms just yet at 8:36 p.m. in the 1000 block of Nevada Way. Thought for the day: A few new residents of the cross-bar hotel tonight. Call(s) of the week: Attempt to locate: A neighboring jurisdiction is advising a white-haired man who “looks like Santa” was inebriated, obnoxious and refused service on a cruise and may be heading our direction. He was verbally abusive to several employees after asking if there were any brothel services nearby at 2:37 p.m. on Nov. 10 in the area of Lakeshore Road and U.S. Highway 93. Assist: The caller would like assistance in locating the subjects that left the location with his severed finger still slammed in the door. They have agreed to return, but he would really like them to expedite at 8:29 p.m. in the area of U.S. 93 and Ville Drive. 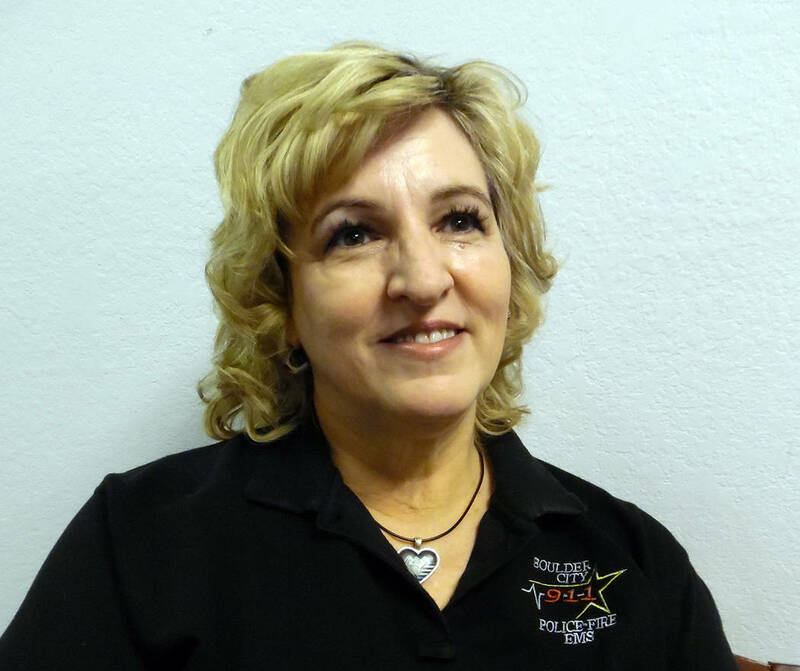 Tina Ransom is a dispatcher with the Boulder City Police Department. She is coordinator of the Boulder City Citizen’s Academy.